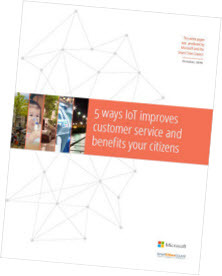 (Redmond, WA) – Nov. 3, 2016 – How local governments around the world are leveraging the Internet of Things to improve customer service and benefit their citizens is the focus of a compelling new white paper from Microsoft and the Smart Cities Council, the world's largest smart cities network. The paper outlines five specific ways the Internet of Things (IoT) delivers value in neighborhoods, downtowns and city halls – from improving the quality of life and enhancing the urban lifestyle to providing insights that improve citizen engagement, service delivery and streamline government operations. The paper ‒ 5 Ways IoT Improves Customer Service and Benefits Your Citizens ‒ is chock full of real-life examples of IoT in action in cities today, from Seattle to Cape Town, Dubai to New Bedford, MA. It also documents how the benefits of IoT get exponentially greater when public agencies combine mobile technologies with fast wireless connectivity, cloud computing, real-time analytics and predictive analytics. "This paper provides a powerful tool for local government leaders who want to better understand the potential of IoT," said Smart Cities Council Chairman Jesse Berst. "In just a few pages they can clearly see how embracing the solutions enabled by data, analytics and IoT can provide increased efficiencies and remarkable insights that lead to stronger, smarter and healthier communities." In addition to more than a dozen "lessons being learned" from IoT projects currently underway in cities and counties around the globe, the paper also explains the importance of developing an IoT strategy that prioritizes transparency, ensures data is managed securely and protects individual privacy. "When public sector leaders look at how to solve chronic problems and the challenges of improving service delivery, technology can serve as an enabler. As the City of Detroit realized that lighting the streets mean everyone feels safe, crime is down and businesses are thriving. To make sure that the lights do stay on, technology can help cities keep street lights on and working properly to provide for a safer community," said Kirsten Edmondson Wolfe, Senior Director from Microsoft. "That’s why we wanted to work with the Smart Cities Council to provide guidance on how cities can truly transform." The paper can be downloaded free of charge on the Microsoft website. Microsoft CityNext empowers cities and citizens to unlock their potential by deliv­ering innovative digital services that can help them lead safer and healthier lives, enriched by high-quality education. AvePoint Citizens Services offers modern solutions to meet today’s demands, provid­ing communities with a centralized portal to easily submit citizen service requests from anywhere, anytime, on any device. Microsoft IoT cloud solutions are about making your data come together in new ways. Tap into data with IoT dashboards. Uncover actionable intelligence. And mod­ernize your organization to meet today’s needs.